Following your nose leads to unexpected pleasures. Sometimes you just have to go where your nose leads you. A few weeks ago, Janine and I were wandering down a side street in Bushwick, hoping to check out some new beer bar. Janine asked me where it was and I pointed unconfidently down the block, whereupon a woman in her early twenties asked me, “Are you looking for the grbledey climilly gorblor?” or at least that’s what is sounded like. I was faced with two options. I could say, “huh?” and ruin the moment, or I could go with it. I went with it. She beckoned for us to follow her down the street, passing the beer bar and any other bits of civilization as we went. While we were being led down a semi lit street late at night in Brooklyn, this was nothing like the time in 1994 when Janine and I hitchhiked down a mountain in Japan, having miscalculated what it would cost to take the bus to the train to our apartment in that great metropolis, Utsunomiya, Japan, where we were living at the time. Someday you should ask me what I think of the Japanese practice of closing the ATMs for the weekend. That time, we were picked up by a slightly odd fellow who seemed very eager to engage us in conversation, which was made rather difficult by the fact that at that time Janine and I spoke about eleven words of Japanese between us and he had no English at all. As we sat in this fellow’s car Janine was convinced that we had been abducted and that we were about to star in the Japanese version of Dawn, Portrait of a Teenage Hitchhiker. As it turns out, the kindly gent wanted nothing more than to show us the highlights of his little mountain town. Four hours later, after visits to two museums, he deposited us at the train station. Needless to say, this encounter with the friendly young lady was nothing like that. The young woman led us through a doorway to a warehouse which opened to reveal a frenzied hub of hopeful young people. 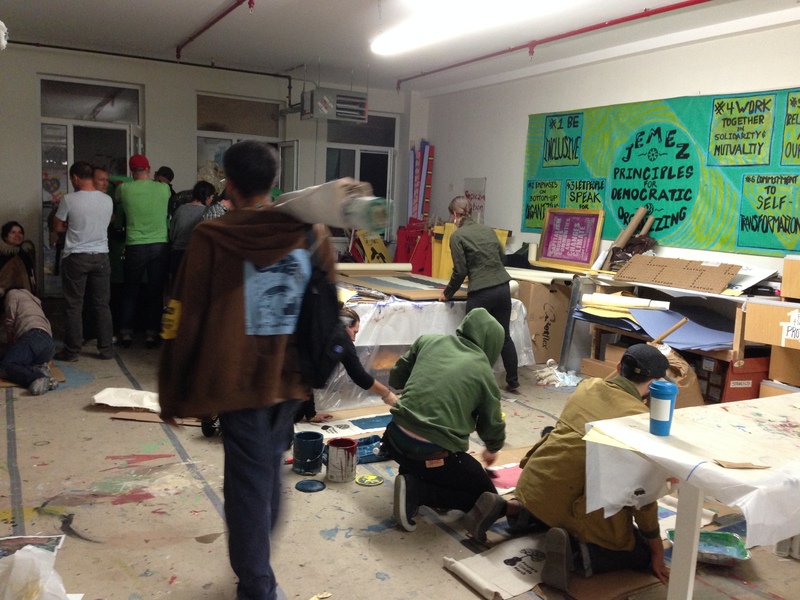 They were making posters, paper mache puppets, and other agitprop protest matériel associated with the climate march that was to occur that weekend. It was a beehive of hope. Janine and I took in the scene and recalled the various marches that we attended and political campaigns we worked on over the years. The young woman, named Sarah, works for a local environmental organization. It was a nice reminder that there is still no shortage of earnest energy focused on solving a problem that some people think is a lost cause. I am somewhat abashed to say that on the Sunday of the march we were enticed away from flexing our protest muscles by a somewhat more prosaic but no less colorful event – the Broadway Flea Market! 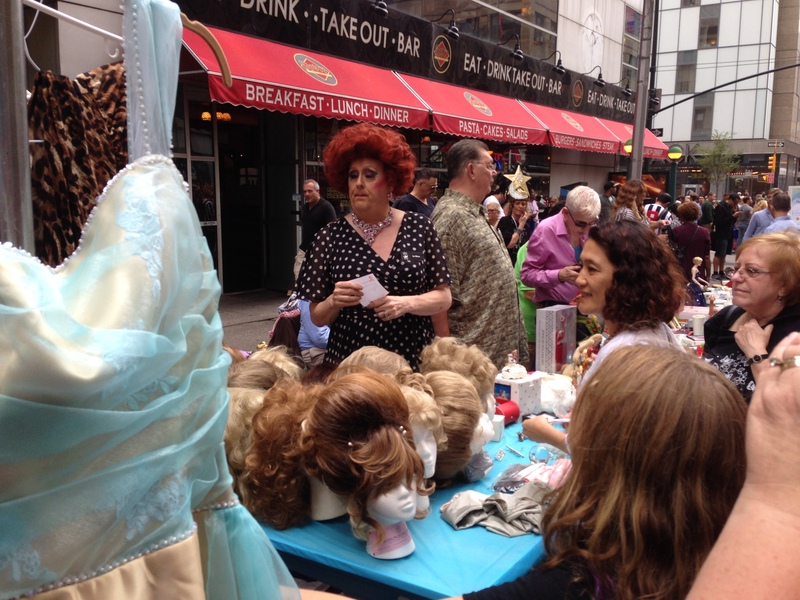 Every year, they block off 44th street between Broadway and 8th to hold a sale of Broadway-related flotsam and jetsam to benefit Broadway Cares/Equity Fights AIDS, which provides grants to help people with AIDS. There are playbills, posters, costumes, and all manner of other Broadway-ilia. There was a rack of pants from Phantom of the Opera – Phantom pants, if you will – there was a bin full of shoes, none of which were apparently warn by the beloved ingénue Sutton Foster. There were flocks of what were clearly theatre students, all jazz hands and fabulous, projecting their voices impressively and occasionally breaking into song. And as I mentioned, there were piles and piles of Broadway stuff. I was pawing through a pile of Playbills and there was a program from an early cast of A Chorus Line with two people I knew from my theatre days. What were the chances? A quick scan of playbills set off a rant (by me) about how they changed the names of half of Broadway’s theaters when I wasn’t looking. What was that all about? As we were getting ready to leave, Janine was thumbing absent mindedly at a batch of theatre posters – the 14 x 22 cardboard cards that sit in shop windows throughout the Broadway district – and imagine her surprise when she found herself staring at a picture of me! Yep, there I was. 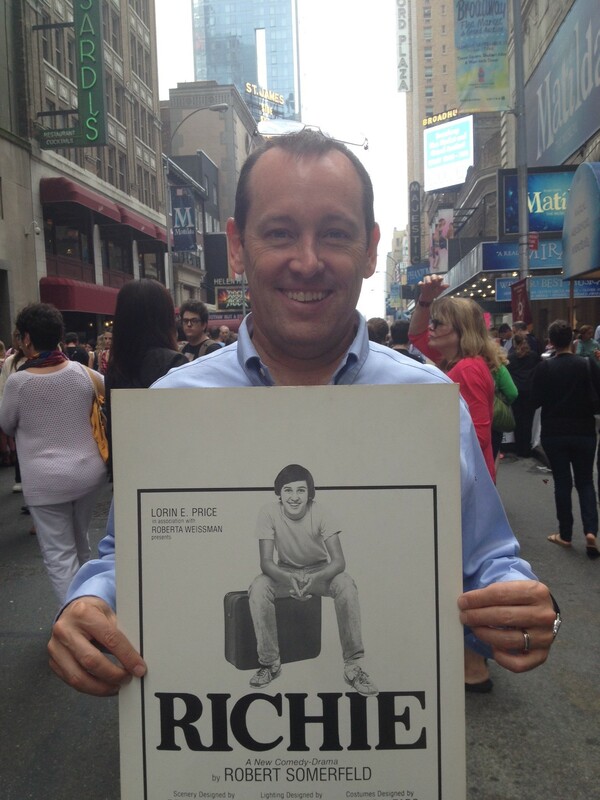 Back in 1980 I played the lead in a goddawful off-Broadway play called Richie, which ran all of eight performances at the Orpheum Theatre on 2nd Avenue and St. Mark’s Place. Who’d have thunk? Janine probably nabbed the next-to-last copy of the poster in existence (my mother has one hanging proudly in her garage). I was thrilled. How much did I pay for this extraordinary piece of off-Broadway history? Er, a buck. I paid the fellow my dollar and couldn’t keep my important news to my self. “That’s me!” I gushed? The guy looked at the poster and then looked at me. “Really?” he asked, unimpressed. “Yes!” I replied. “Oh,” he said. Tough crowd. The moral of the story? Poke through the bins. Also, use discretion, but be adventurous. ← The Speakeasy Restaurant Revealed – plus, extra speakeasies! Remember I was one of the few that actually sat through the show! !! Now THAT is Kismet! And I love the BC/EFA flea market. Lots of treasures waiting for just the right person to find them.